NatureServe determines the severity of risk to these species with their Climate Change Vulnerability Index, based upon their individual habits that determine their sensitivity to ecological change. Those animals that have the greatest dependence on the cold and snow climate of the Arctic are at the greatest risk. For example, animal species that are dependent on the tundra land condition are at enormous risk. The Arctic is now experiencing some of the most rapid and severe climate change on Earth. Over the next 100 years, climate change is expected to accelerate, contributing to major physical, ecological, social, and economic changes, many of which have already begun. Changes in arctic climate will also affect the rest of the world through increased global warming and rising sea levels. 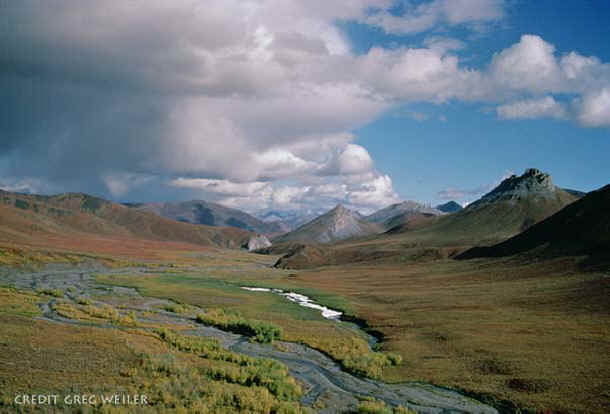 The Arctic Refuge is particularly sensitive to the fluctuations caused by climate change; permafrost, ice flow, and winter dependent wildlife suffer catastrophic effects as a result. The fragile ecosystem of the Arctic maintains the rate of vegetation growth and decomposition, affecting the ability of its wildlife to locate sufficient food and water to sustain life. Warmer temperatures have set into motion a destructive chain of events—increasing forest fires (by 38% in the past half-century,) a growth in parasites, insect migration and invasive plant species are all consequences (EPA.gov.) The Defenders of Wildlife, a non-profit conservation organization founded in 1947, recently released findings that demonstrate a much greater threat to the wildlife of the Arctic National Wildlife Refuge than previously estimated. The Defenders of Wildlife report, Climate Change and the Arctic National Wildlife Refuge: Which Species Are Most At Risk?, using research models from NatureServ (the world’s largest database of research on threatened ecological species,) have predicted a high risk to 16 species of Arctic wildlife as a result of climate change, including six species that are under “extreme” hazard: polar bear, arctic fox, musk ox, tundra vole, brown lemming, and the collared lemming. NatureServ & the Defenders of Wildlife classifies extreme as risk of disappearing entirely from the Arctic Refuge by 2050. Ten species, the lynx, wolverine, caribou, Dall sheep, Alaskan marmot, arctic ground squirrel, singing vole, northern bog lemming, tundra shrew and barren ground shrew, are classified as “highly vulnerable,” likely to have significant reduction in numbers by 2050. NatureServe determines the severity of risk to these species with their Climate Change Vulnerability Index, based upon their individual habits that determine their sensitivity to ecological change. Those animals that have the greatest dependence on the cold and snow climate of the Arctic are at the greatest risk. For example, animal species that are dependent on the tundra land condition are at enormous risk. As the rain fall of the Arctic increases, this leads to a “freeze-thaw” cycle, ultimately destroying low-lying vegetation and collapsing burrows of smaller mammals. The key findings of the ACIA study corroborates the threatened status of species proposed by the Defenders of Wildlife, notably that the Arctic climate is warming at a much faster rate than initially thought, and will have consequences of a global scale through the reduction of wildlife and arctic sea ice. Specifically to the Arctic Refuge, the increasing thaw of permafrost, reduction in ice flow size, and growth of invasive plant species—primarily caused because of human intrusion, greenhouse gas emissions and harvesting of marine and land animals. None of these species of animals is more widely known for this perilous status as the polar bear. As Arctic ice decreases, polar bears experience incredible hardships in survival—especially as we move closer to an ice-free summer in the Arctic. The only solution, as Defenders of Wildlife points out, is the significant reduction of greenhouse gas emissions (fossil fuels) on a global scale. This is, of course, more complicated than imagined. The Earth's atmosphere has a long memory for fossil fuels, and even if all emissions were to stop now, the levels already present in our atmosphere would continue to increase global warming for decades. The oil industry of the North Slope region, adjacent to the Arctic National Wildlife Refuge, produces a massive contribution to greenhouse emission—an excess of 50,000 tons of nitrogen oxide. This number surpasses more than twice the amount of our nation’s capital, in addition to the 2-11 tons of carbon dioxide, and at least 24,000 tons of methane produced in North Slope oil production. Spills occur with disturbing regularity, nearly a “spill a day,” 1,600 spills from 1996 to 1999, (and these numbers are a decade old, from the Natural Resources Defense Council.) This doesn’t include pollution occurring from offshore drilling. Invest greater research into monitoring the most vulnerable of animal species, which would allow a better understanding of how climate change affects their survival. Will the US and international governments heed these warnings (have they yet?) How society responds to this report by the Defenders of Wildlife is a question mark. Reducing reliance on fossil fuels is a debate fraught with complexity—but there is no debate that the most significant action is one that is completely within the reach of every individual. It’s already beyond debate that cutting out animal agriculture will make an unequivocal impact on greenhouse emissions; drive less, and go vegan. Those who would argue otherwise just aren’t paying attention.